Keeping in trend with sustainability, a custom motorcycle garage, has definitely hit the mark with both looks and efficiency. 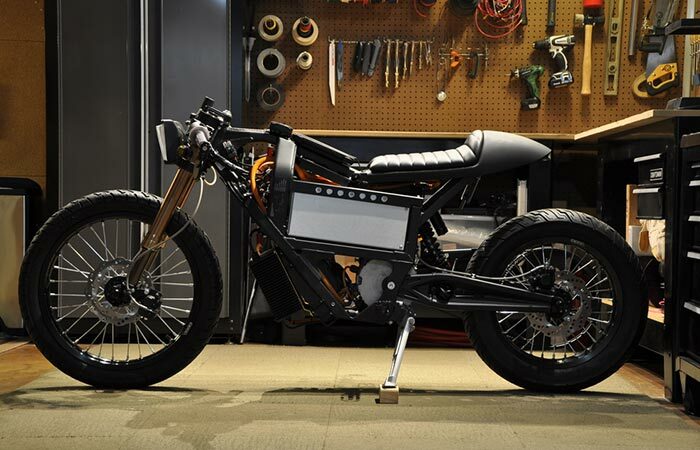 Introducing the mobile art of Night Shift Bikes Customized Electric Motorcycles. Night Shift Bikes was started by Matt Candler in 2006. He simply decided to build motorcycles as a way to detach from the stress of his day-time job. Now, we feature some of the great builds that he has done so far. Starting off with a Honda Rebel, he improved his skills and created the Zero Café. Finally, we are met with the Leafy Savage. The Rebel was Night Shift’s first build. It’s features a stretched out Honda Rebel that has been fitted with a golf cart drivetrain. Night Shift Bikes first build was a 1987 Honda Rebel 250. With the aid of John Bidwell’s EL Chopper ET manual, they chopped and stretched it, and stuck the guts of a golf cart drivetrain inside. It features a bunch of other mods as well. These include 6” overstock front end, 10 rise handlebars, Arlen Ness headlamp, Harley seat and many more. The Rebel also has a range of 20 miles (32 kilometers) and has a top speed of 60 mph (96 km/h). The Zero Cafe was a factory electric from Zero Motorcycles that got the Cafe treatment. This made it a compact urban commuter with a definite retro style. With their first build complete, their next move was the Zero Café. 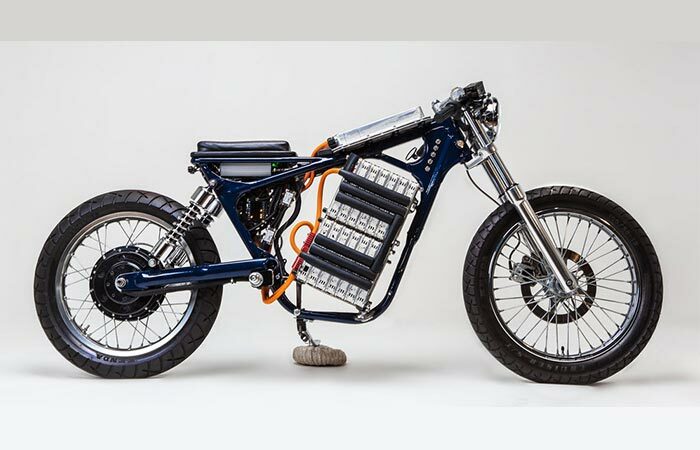 A factory electric from Zero Motorcycles was given the Café treatment. This made an already lightweight Zero XU into a particularly compact urban transporter. Some of the mods include removed bodywork, wiring redesign, clip on handlebars and more. However, to give it a unique look, it wouldn’t be complete without the custom headlight bracket, new KC headlamps and a Ryca motors café seat and taillight unit. The Leafy Savage is a 2003 Suzuki Savage that has been outfitted with a Nissan Leaf battery pack and a custom motor by Enertrac. Their last build, and second from the ground up, is the Leafy Savage. 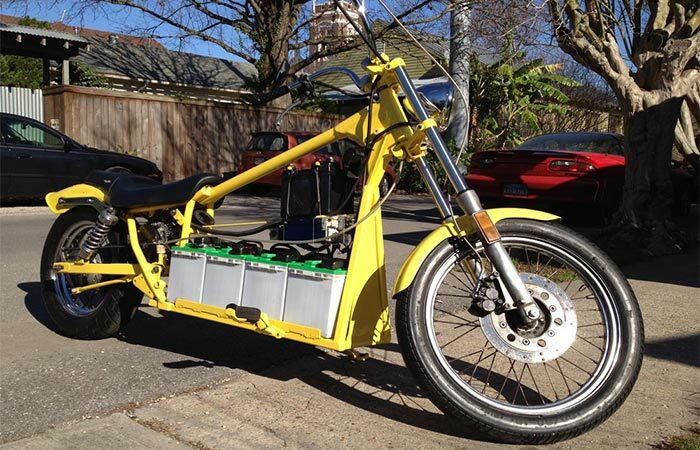 This bike is the result of an electric-drive conversion of a 2003 Suzuki Savage. The motor is a customized brushless DC motor from Enertrac and the battery pack was salvaged from a Nissan Leaf, hence the name.